One of the perks of being a world-renowned* barbecue blogger is occasionally getting free stuff in the mail. Usually the bounty is barbecue cookbooks but sometimes its edible. Recently the good folks at SAAS Hot Sauce sent me samples of their two fiery and flavorful hot sauces, Original Flavor and Onion & Garlic. I am still struggling to figure out why these seemingly competent folks would bother to mail their sauce all the way from the, ahem, barbecue capital of Upper Montclair, New Jersey to North Carolina. Regardless, I feel compelled to say some kind words because they deserve a plug. Both SAAS sauces I sampled are really, truly excellent. And, in case you wondered, my kind words can’t be bought for $10 worth of hot sauce. (Ten bucks worth of beer on the other hand… .) The sauces have a thin consistency that works well as a flavor enhancer at the table or as a marinade, if applied cautiously. They are generously spiked with habanero peppers, among other ingredients, so they are seriously HOT and have a deep, layered flavor profile. (I sampled the “spicy hot” varieties, not the mild ones, so cannot comment on the latter.) If you enjoy heat, give ’em a try. A word of caution: I don’t think the SAAS spicy hot sauces belong anywhere near traditional barbecue–their flavors are simply too strong–but the sauces would work nicely for spicy chicken wings, adding heat/flavor to Asian cooking (a hipster alternative to the now ubiquitous Sriracha? ), and so on. 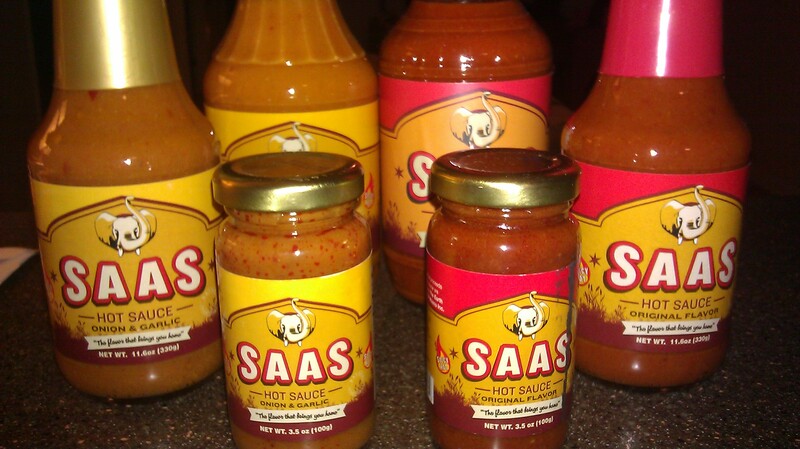 If you live in the New York area check out SAAS’ sauces at a local grocer, or anyone can order online. Thanks for the sauce, y’all. Now can someone please ship me a whole hog for a change? *Spambots from other countries sometimes visit my website. Thanks to the good folks at the NC BBQ Company, who are offering BBQJew.com readers (that’d be you, nimrod) a chance to win some free pork. In exchange for my blessing to include some past writings in their newsletter, the NC BBQ Company has offered a free Battle Box for a lucky reader. But there is no such thing as a free lunch, so you have to earn it. For a chance to win the Battle Box (retail value $55), you must write me at BBQJew at gmail.com and do one of the following things: tell me why you like NC barbecue; tell me your most or least favorite part of this website; or send me an original (by yourself, wiseguy) BBQ-related photo, essay, poem, video or whatever else you can dream up. I’ll randomly draw the winner from among all entrants. Note: All entrants agree to allow me to post their submittals on this website. Also, your odds of winning vary depending on whether or not my mom submits an entry.